Welcome to our live blog of the Pope’s visit to Birmingham for the beatification of Cardinal John Henry Newman. We’ll be providing links to the most interesting content from around the web and providing up-to-the-minute coverage of what’s happening. Don’t forget to send us your own pictures, stories and video! You need to refresh this page to see new updates. 18.40 The Pope boards his aeroplane and leaves British soil. A highly successful trip that has brought joy to millions of British people, a historic visit for our country and our Church. God bless you, Papa Bene. 18.32 Pope: “I treasure the time spent with the bishops, clergy and laity, teachers, pupils and others.” It was an honour to be in Birmingham to celebrate Cardinal Newman, who has much to teach us about the challenges of this world. Says he’ll pray for the peace and prosperity of Great Britain. “God bless you all! He speaks about common UK-Vatican goals on tackling climate change, poverty and disease. He promises to maintain levels of aid. 18.22 David Cameron hails “a truly historic state visit to Britain”. He says: “You spoke to a nation of 6 million Catholics but were heard by a nation of 60 Million citizens. You have offered a message – to follow our conscience. To ask not what are our entitlements, but what are our responsibilities. “Cardinal Newman once said that by one special deed, evinces more true faith than can be shown by the most intimate knowledge of scripture. Cardinal Newman reminded the world of a need for education for life. 17.52 En route to Birmingham Airport, many people still line the streets in Birmingham suburbs. 17.45 The papal visit has been a “spiritual success”, according to Vatican spokesman Fr Federico Lombardi, who told a press briefing outside Cofton Park that Benedict had captured the “hearts and minds that understand” and had received a “wonderful reception”. The trip had been “very, very positive”. 17.40 According to the Telegraph, the Prime Minister will give a speech at the airport just before the Pontiff leaves. 17.37The motorcade has set off again. Our theory is the Pope asked for the cars to go more slowly so that bystanders could glimpse him as he passed. 17.36The cars have just come to a halt. The doors of the Pope’s car open, then close. Not sure what’s happening here. 17.34 And the Pope’s motorcade is off to Birmingham International Airport, where the Holy Father will deliver a farewell speech. 17.32 A touching scene as the seminarians sing heartily for the Pope. Benedict XVI pauses outside his car, soaking up the atmosphere. 17.28 Benedict XVI exits St Mary’s, Oscott, to cheers from seminarians. He pauses for a photograph with the police, who have done a fine job of looking after him. He has was just introduced to a police dog. A well-known animal lover, he stroked its head with enthusiasm. 17.22 The bishops are assembling before the altar for a photograph recreating a painting of the first synod of the restored Catholic hierarchy in 1852. You can see the original here. Here’s a close-up of Cardinal Newman, who stands on the right-hand side. 17.17 The bishops greet the Pope one by one. They each offer a few words of thanks. 17.12 The Pope and the bishops exchange gifts. Archbishop Nichols describes a “special gift” that he is about to present, connected to the life of the Venerable Bartholomew Holzhauser. Holzhauser was dean and pastor of Tittmoning, the Bavarian village where Joseph Ratzinger lived as a child. The gift is a book that connects Holzhauser to St Mary’s, Oscott. 17.11 The Pope then refers back to his ad limina meeting with the bishops of England and Wales in February. The other matter I touched upon in February with the Bishops of England and Wales, when I asked you to be generous in implementing the Apostolic Constitution Anglicanorum Coetibus. This should be seen as a prophetic gesture that can contribute positively to the developing relations between Anglicans and Catholics. It helps us to set our sights on the ultimate goal of all ecumenical activity: the restoration of full ecclesial communion in the context of which the mutual exchange of gifts from our respective spiritual patrimonies serves as an enrichment to us all. Let us continue to pray and work unceasingly in order to hasten the joyful day when the goal can be accomplished. 17.09 The Pope raises two particular concerns with the bishops. The first is the new translation of the Mass in English. He urges the bishops to “seize the opportunity that the new translation offers for in-depth catechesis on the Eucharist and renewed devotion in the manner of its celebration”. 17.08 Benedict XVI returns to the theme of child protection. He acknowledges again that Church leaders have often responded inadequately to abuse. Another matter which has received much attention in recent months, and which seriously undermines the moral credibility of Church leaders, is the shameful abuse of children and young people by priests and religious. I have spoken on many occasions of the deep wounds that such behaviour causes, in the victims first and foremost, but also in the relationships of trust that should exist between priests and people, between priests and their bishops, and between the Church authorities and the public. I know that you have taken serious steps to remedy this situation, to ensure that children are effectively protected from harm and to deal properly and transparently with allegations as they arise. You have publicly acknowledged your deep regret over what has happened and the often inadequate way it was addressed in the past. Your growing awareness of the extent of child abuse in society, its devastating effects, and the need to provide proper victim support, should serve as incentive to share the lessons you have learned with the wider community. Indeed, what better way could there be of making reparation for these sins than by reaching out, in a humble spirit of compassion, towards children who continue to suffer abuse elsewhere? Our duty of care towards the young demands nothing less. 17.06 The Pope urges the bishops to be a prophetic voice for the needy and disadvantaged. Since your visit to Rome, political changes in the United Kingdom have focused attention on the consequences of the financial crisis, which has caused so much hardship to countless individuals and families. The spectre of unemployment is casting its shadow over many people’s lives, and the long-term cost of the ill-advised investment practices of recent times is becoming all too evident. In these circumstances, there will be additional calls on the characteristic generosity of British Catholics and I know that you will take the lead in calling for solidarity with those in need. The prophetic voice of Christians has an important role in highlighting the needs of the poor and disadvantaged, who can so easily be overlooked in the allocation of limited resources. In their teaching document Choosing the Common Good, the Bishops of England and Wales underlined the importance of the practice of virtue in public life. Today’s circumstances provide a good opportunity to reinforce that message and indeed to encourage people to aspire to higher moral values in every area of their lives, against a background of growing cynicism regarding even the possibility of virtuous living. 17.04 The Pope has just urged the bishops to put new energy into efforts at evangelisation and promote new movements in the Church. This has been a day of great joy for the Catholic community in these islands. Blessed John Henry Newman, as we may now call him, has been raised to the altars as an example of heroic faithfulness to the Gospel and an intercessor for the Church in this land that he loved and served so well. Here in this very chapel in 1852, he gave voice to the new confidence and vitality of the Catholic community England and Wales after the restoration of the hierarchy, and his words could be applied equally to Scotland a quarter of a century later. His beatification today is a reminder of the Holy Spirit’s continuing action in calling forth gifts of holiness from among the people of Great Britain, so that from east to west and from north to south, a perfect offering of praise and thanksgiving may be made to the glory of God’s name. I thank Cardinal O’Brien and Archbishop Nichols for their words, and in so doing, I am reminded how recently I was able to welcome all of you to Rome for the ad limina visits of your respective episcopal conferences. We spoke about some of the challenges you face as you lead your people in faith, particularly regarding the urgent need to proclaim the Gospel afresh in a highly secularised environment. In the course of my visit it has become clear to me how deep a thirst there is among the British people for the Good News of Jesus Christ. You have been chosen by God to offer them the living water of the Gospel, encouraging them to place their hopes, not in the vain enticements of this world, but in the firm assurances of the next. As you proclaim the coming of the Kingdom, with its promise of hope for the poor and the needy, the sick and the elderly, the unborn and the neglected, be sure to present in its fullness the life-giving message of the Gospel, including those elements which call into question the widespread assumptions of today’s culture. As you know, a pontifical council has recently been established for the New Evangelisation of countries of long-standing Christian tradition, and I would encourage you to avail yourselves of its services in addressing the task before you. Moreover, many of the new ecclesial movements have a particular charism for evangelisation, and I know that you will continue to explore appropriate and effective ways of involving them in the mission of the Church. 17.01 The Pope begins his hotly anticipated speech. 17.00 “Your visit to us was both state and pastoral, but our farewell to you is wholly personal,” the archbishop says. 16.59 The archbishop says the beatification of Cardinal Newman was the true end of the Year for Priests. 16.51 The cardinal highlights the Scottish links of the new Blessed John Henry Newman. 16.50 Cardinal O’Brien begins his speech. He says Benedict XVI showed that he was proud to be an honorary Scot for the day by wearing the special papal visit tartan scarf. 16.46 The chapel is filled with organ music. The Pope, the cardinal and the archbishop kneel in prayer before the altar. 16.45 Pope Benedict is preparing to enter the chapel. He is standing on the threshold with Cardinal O’Brien and Archbishop Nichols. 16.39 The chapel offers a stunningly backdrop to one of the Pope’s most eagerly awaited speeches. Here’s an architectural description from the St Mary’s College, Oscott, website. The main window portrays the Virgin Mary as Queen of Heaven, bearing the infant Christ. Surrounded by radiant golden light, she is flanked by St. Catherine of Alexandria and by St. Cecilia. Next to St. Catherine is St. Gregory the Great, and alongside St. Cecilia, St. Thomas Becket. This window was designed by Pugin and manufactured by Warrington of London. The altar was constructed by Pugin by medieval fragments and wooden sculptures to his own design. The reredos consists of medieval carved scenes set in a framework designed by Pugin. The whole reredos is topped by wooden tracery and a series of medieval carvings. Beneath the reredos and tabernacle, set into the wooden panelling are a series of sixteenth century Limoges enamel panels which depict scenes from the Passion, Death and Resurrection of Our Lord. The sermon was a moving account of the recovery of English Catholicism from the dark days of penal times to its Victorian splendour. It came to characterise the expression of the restoration of Catholicism, and the very title ‘The Second Spring’ passed into common usage to describe Catholic life in Victorian England. 16.18 Welcome back. The bishops are starting to take their seats at Oscott Chapel. The speeches are scheduled to start at 16:45. Cardinal Keith O’Brien will address Pope Benedict on behalf of the Scottish bishops. Archbishop Vincent Nichols will then speak on behalf of the bishops of England and Wales. The Holy Father will then address the assembled bishops of Scotland, England and Wales. The Pope was given a rock star reception last night as more than 100,000 ecstatic worshippers cheered him through the streets of London. Benedict XVI sparked the carnival celebrations as his famous Popemobile made its way through packed streets to an open air prayer vigil in Hyde Park. Cofton Park was cloaked in inky darkness when the first pilgrims first started to trickle on to the site at 3am. The air was chilled and drizzle swept down. Nevertheless they all sought out small pots of land to make their own and brave the elements, waiting for the Pope to arrive. The feeling of excitement began to mount as images from the big screens showed the Pope flying to Birmingham airport on his helicopter. When he disembarked a cheer went around the arena, which by then had swollen to 60,000 people. Flags were unfurled, people cheered, the cheers became a clamour as the Pope drew near in his Popemobile. As if by divine providence, the rain stopped, the sky brightened and the sun came out as he arrived. He received the same kind of rapturous welcome as he had experienced from British crowds from London and Glasgow days earlier. I was about 40 ft away. People drew near with their children hoping he would kiss them. He looked a bit tired, it’s the most tired I’d seen him. There was an intense solemn liturgy which demanded and gained the full attention of the vast throng who had made it there. Catriona and Steve Herbert had waited for six hours in the cold with their eight children aged between 13 years and 13 months. They passed the time talking and praying in the rain and handing out sandwiches beneath a large sleeping bag. They were convinced they were witnessing a moment of historic significance in both the lives of the British nation and the Catholic Church in this country which they wouldn’t miss for the world. Husband Steve: “It’s the first time anybody has been beatified by a pope in this country but here you have a Pope from Germany beatifying Cardinal John Henry Newman on the anniversary of the Battle of the Britain. Catriona said she believed they were witnessing the healing of the wounds caused by the Second World War and the Reformation. Irishman Ian Johnston, 50, from Tooting, was among 50 Neocats camped out on the wet grass since 4am. “It was wonderful to see the sun come out as the Pope arrived. 14.13 Alexander DesForges (Church spokesman) and Archbishop Nichols are milling around the entrance. 14.10 Pope has arrived at Oscott College, the seminary of Birmingham archdiocese. He must be feeling quite peckish by now. Let’s hope they have Fanta. I have seen the Pope quite close up on two occasions during this extraordinary state visit. Last night Ed West and I were standing in the crowd at the vigil at the side of the stage at the exact spot, unknown to us, where the Popemobile was to come cruising slowly past. We got a clear view of the Holy Father just a few yards away from us behind the bullet-proof glass. Ed and I are both reasonably robust individuals, I like to think, but for a while we were like a couple of overwrought schoolkids. Honestly, it was a heart-stopping moment. No wonder James MacMillan is predicting a Benedict bounce. The man has an extraordinary presence, and a pellucid style of speaking that gets to the heart of things with simple words. This is perhaps why he appeals so much to the young. He smiles all the time, beatifically, and, what’s more, there’s a definite twinkle in his eye. 13.52 The Pope has now left the Birmingham Oratory and is heading to Oscott seminary to have lunch with the Bishops of England and Wales. After that there will be a meeting, and the Pope will address the bishops. 13.31 Daniel Hall (@dandanpianoman) has just tweeted: “So proud of my dad for making the pope’s chair”. His father, Ian Hall, is a deputy head at Cardinal Newman school in Coventry, and made the papal chair for the beatification Mass. He crafted it out of American white ash with the help of two other teachers. He used to be a pattern maker for Rover, and then for a small foundry at Gloucestershire. A couple of months ago, he told the Herald that it was “not just about making pieces of furniture”. 13.27 Long Vatican flags are draped over the front of the Oratory residence. 13.26 Big cheer from the crowd as the Holy Father enters the Birmingham Oratory. 13.24 The Holy Father has exited the Popemobile. There is a Welsh flag in the crowd – and it’s about 10 people deep. The Pope is leaning over the barriers to greet them. Archbishop Bernard Longley is with him. 13.24 Ah – the Popemobile has finally slowed down. Security guards walking alongside it – they don’t even have to jog now. Suddenly there is a burst of cheering and Vatican flag-waving. 13.19 David Twiston Davies, the much-loved Catholic journalist, is at Cofton Park. He says he believes the beatification “firmly establishes that Catholicism is becoming part of mainstream British society”. 13.16 The Popemobile has started to pass crowds but it is going faster than usual – no security guards jogging alongside it. I hope for the people who have waited in the rain that it slows down a little. 13.12 Confirmed: the Holy Father is in the Popemobile. 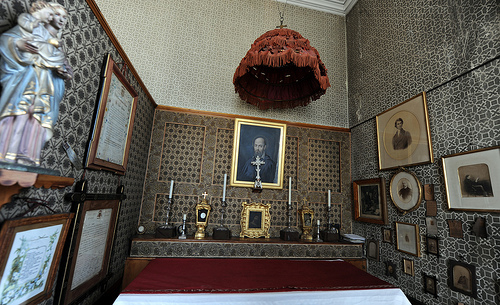 13.10 Inside the chapel will be Newman’s relics: a lock of hair, a drop of blood and secondary relics retrieved from his grave (these include tassels from his cardinal’s hat). 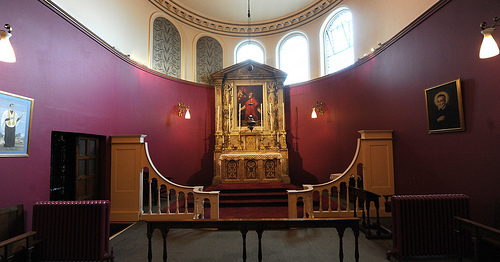 13.05 When the Pope arrives at the Birmingham Oratory, he will see Newman’s room, along with his private chapel. The St Philip Neri chapel at the Birmingham Oratory has just been turned into a shrine to Newman – and the Pope will be the first person to pray there. I’m just standing in admiration at all the people who have waited from 4am with their children in the cold. There are plenty of families, quite a few people who went from Hyde Park, who just had a few hours sleep. The crowd was more English than in London. The weather was awful, really awful. It was just by chance that the sun came out just as the Pope arrived and there was this big roar. 13.00 The Holy Father is going to the Oratory on a private pilgrimage. Not sure yet how much we’ll all be able to see. Newman founded the Oratory at Maryvale, near Birmingham, in 1848. 12.55 Crowds are already massed along the edge of Hagley Road, near the Birmingham Oratory. It is the only chance for Brummies to see the Holy Father if they do not have tickets for Cofton Park. The Pope will presumably transfer to the Popemobile soon. Margaret Hiscock: It’s been very emotional. It makes me think of all the ordinary people I know who have given up everything, like Newman [to serve others]. The atmosphere has been ecstatic. Anne Dunne: Every moment has been wonderful. It’s been a fantastic occasion, very joyful and informative, and the bidding prayers were in a variety of different languages, and the contribution of the Church of England to Newman’s formation, that was brought out very well. Everybody young and old, they are all enjoying themselves – there’s a great sense of contentment and togetherness. 12.41 Pope is greeting Deacon Jack Sullivan. Before that he met Princess Michael of Kent, Lord and Lady Nicholas Windsor, the Duke of Norfolk, and other dignitaries. He has just got into what looks like a black Mercedes. 12:27 Pope Benedict is now heading off to the Birmingham Oratory. There are large numbers of people waiting on the Hagley Road to greet the Popemobile. 12:20 The Mass is ended. The concluding hymn is “For all the saints, who from their labours rest” with music by Vaughan Williams. 12:16 He’s giving the big papal blessing. 12:13 And now for the Angelus…which was prayed in Latin. “Angelus Domini nuntiavit Mariæ”, “the angel of the Lord declared unto Mary”. 12:09 Fr Lombardi has just said that there were 80,000 faithful at Hyde Park yesterday and another 200,000 faithful lining the streets. Meanwhile the Protest the Pope people have been saying they had 20,000 protestors but the Metropolitan police estimates it at 2,000. Difficult to say what the real number was. As the service continues Federico Lombardi, the papal spokesman, has just given a briefing to journalists. He said it has been a “wonderful trip”. We’re trying to get some audio of the briefing. 12:00 The Pope is in the diocese of TV pundit Anglican Bishop Geoffrey Rowell, Bishop of Gibraltar in Europe, who also came to the Mass at the Birmingham Oratory last year when Newman’s relics were placed in teh Church. 11:56 Interesting. The song being sung as Communion is being distributed has two verses by John Keble, a leading member of the Oxford Movement and contemporary and friend of Blessed John Henry Newman. Is this a gesture to Anglo-Catholics and a reminder also of Newman’s place in Anglican theology? Thirty people from the Birmingham Oratory were chosen to receive Communion from the Holy Father. 11:53 James MacMillan’s Lamb of God. At the sign of peace, Deacon Jack Sullivan and the Pope exchanged the kiss of peace. 11:52 Pope Benedict invoked the intercession of Blessed John Henry Newman in the Canon for the first time. 11:45 They’ve managed to use three of the four Eucharistic Prayers during the Pope’s visit. Yesterday at Westminster, the Holy Father used Eucharistic Prayer I which comes from the Roman Canon and is used in the traditional Latin form of the Mass, while they used Eucharistic Prayer II at Bellahouston Park. Eucharistic Prayer II has it’s origins in the Second Century but was revived after the Second Vatican Council. Eucharistic Prayer III and IV were put together after the Council and are the most modern of the three. 11:44 The Catholic Herald’s eloquent Andrew M Brown and Damian Thompson are live blogging over at the Telegraph. 11:40 Now for the Sanctus by James MacMillan (Holy, Holy, Holy) which precedes the Eucharistic Prayer. 11:36 The Sacred Vessels for this Mass in part were commissioned and made by Birmingham craftsmen. Others were commissioned for the whole visit and have been used in all the papal Masses. The congregation is being censed. 11:31 The Offertory is another song by Newman “Firmly I believe and truly God is Three” . 11:28 The prayers of the faithful are being prayed in German, Welsh, French, Vietnamese and Punjabi. 11:21 Everyone is singing the Nicene Creed, Credo III, in Latin. 11:16 And now, for the aspect of Newman’s life that the bishops of England and Wales have focused on heavily ahead of the Pope’s visit: Newman the Pastor. 11:12 The Pope has made the laity one of the chief focuses of his visit. He has continued to emphasise Newman’s call to the laity and it is the laity that has come out in its tens of thousands to greet and cheer the Pope. I would like to pay particular tribute to his vision for education, which has done so much to shape the ethos that is the driving force behind Catholic schools and colleges today. Firmly opposed to any reductive or utilitarian approach, he sought to achieve an educational environment in which intellectual training, moral discipline and religious commitment would come together. The project to found a Catholic university in Ireland provided him with an opportunity to develop his ideas on the subject, and the collection of discourses that he published as The Idea of a University holds up an ideal from which all those engaged in academic formation can continue to learn. And indeed, what better goal could teachers of religion set themselves than Blessed John Henry’s famous appeal for an intelligent, well-instructed laity: “I want a laity, not arrogant, not rash in speech, not disputatious, but men who know their religion, who enter into it, who know just where they stand, who know what they hold and what they do not, who know their creed so well that they can give an account of it, who know so much of history that they can defend it”. On this day when the author of those words is raised to the altars, I pray that, through his intercession and example, all who are engaged in the task of teaching and catechesis will be inspired to greater effort by the vision he so clearly sets before us. 11:08 Returning to a theme that has marked his speeches in Britain to date, Benedict speaks of England’s martyrs, but says it is “right and fitting that we should recognise today the holiness of a confessor, a son of this nation who, while not called to shed his blood for the Lord, nevertheless bore eloquent witness to him in the course of a long life devoted to the priestly ministry, and especially to preaching, teaching, and writing”. He is worthy to take his place in a long line of saints and scholars from these islands, St Bede, St Hilda, St Aelred, Blessed Duns Scotus, to name but a few. In Blessed John Henry, that tradition of gentle scholarship, deep human wisdom and profound love for the Lord has born rich fruit, as a sign of the abiding presence of the Holy Spirit deep within the heart of God’s people, bringing forth abundant gifts of holiness. 11:04 Pope Benedict has alluded to the Battle of Britain, the 70th anniversary of which is celebrated today, praising Britain’s role in defeating Nazism. For me as one who lived and suffered through the dark days of the Nazi regime in Germany, it is deeply moving to be here with you on this occasion, and to recall how many of your fellow citizens sacrificed their lives, courageously resisting the forces of that evil ideology. My thoughts go in particular to nearby Coventry, which suffered such heavy bombardment and massive loss of life in November 1940. Seventy years later, we recall with shame and horror the dreadful toll of death and destruction that war brings in its wake, and we renew our resolve to work for peace and reconciliation wherever the threat of conflict looms. Yet there is another, more joyful reason why this is an auspicious day for Great Britain, for the Midlands, for Birmingham. It is the day that sees Cardinal John Henry Newman formally raised to the altars and declared Blessed. 11:03 Claz Gomez has tweeted a picture of some her fellow pilgrims deep in thought about the Gospel. 10:56 Deacon Sullivan has been blessed by the Pope and is now about to proclaim the Gospel. From Luke 16:1-13. 10:49 Cardinal John Henry Newman has become the number one trending topic on Twitter in the Britain and I just spotted a group of Dominican students in crowd, including Br Robert Verrill OP who makes his Solemn Profession on Wednesday this week. into the fullness of your truth. Holy Spirit, one God for ever and ever. 10:43 Now we have James MacMillan’s Gloria again. As we saw at Bellahouston in Glasgow on Thursday, it works well with large crowds and uses the new translation of the Missal. 10:39 Someone has already updated the Blessed John Henry Newman’s Wikipedia page. Amazing. Thanks to Rachel Obordo who tweeted it. 10:32 Archbishop Bernard Longley of Birmingham has just requested the beatification of John Henry Newman. Fr Richard Duffield, the Provost of the Birmingham Oratory, is reading a biography of the soon-to-be-blessed. 10:31 The papal throne for the Mass at Cofton Park was designed by Ian Hall, the deputy head master of the Cardinal Newman School in Coventry, with the help of two senior staff members. 10:30 Pope Benedict is leading the Act of Contrition. 10:25 Archbishop Bernard Longley welcoming Pope, who has been “among us as a pilgrim”. “Come ring out our joy to the Lord…” Usually the invitatory psalm for the Divine Office. 10:18 Processing in, The Pope is wearing white and gold vestments while the bishops are wearing almost pure white. 10:15 Praise to the Holiest in the Height, by Cardinal Newman for the entrance procession. They sang this at St Peter’s Residence yesterday. The Mass has begun. 10:10 Father Tim Finigan tweets. Apologies to the neighbours for waking them up last night singing “God bless our Pope” as the coach left for Birmingham. Won’t happen again. 10:09 A bright spark over at Catholic Voices has taken a picture of the protestors at Cofton Park. 10:07 The bishops of England and Wales are sitting on the sanctuary waiting for the Holy Father. 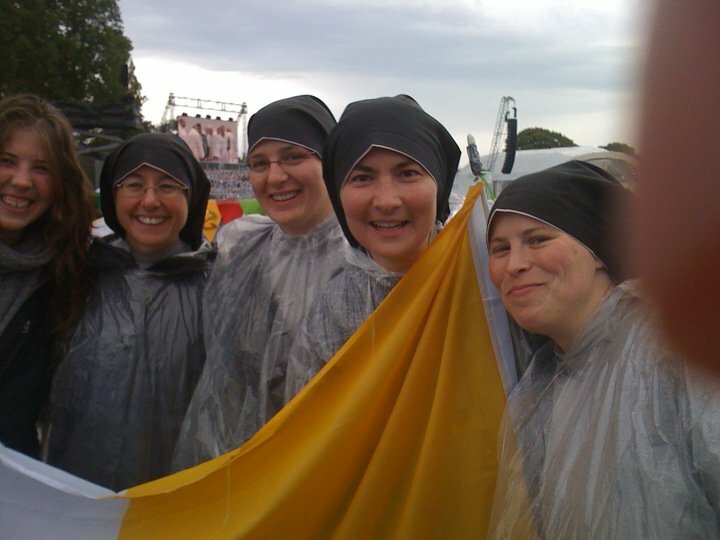 All look like they are wearing ponchos over their chasubles. 10:05 Deacon Jack Sullivan, the American deacon who was miraculously cured thanks to the intercession of Cardinal Newman, will be proclaiming the Gospel for the Mass today. He just gave an interview to Huw Edwards on the BBC. Should be available on BBC iPlayer later on. 10:03 While Pope Benedict goes to vest for Mass, the congregation sings “Christ be our light”, 1994 by Bernadette Farrell. 10:00 The Catholic Herald’s news editor, Simon Caldwell, reports fromm Cofton Park. It’s been bucketing down all night – I got here at 5 o’clock in the morning and it was very dark. People have been tramping in the mud and the dark and everyone’s been really patient. And the sun has come out just as the Pope has arrived. It’s a really good atmosphere – lots of expectation and joy. And it looks beautiful. 09:58 Members of the congregation run to try and catch up with the Popemobile. 09:55 The choir is now singing Montiverdi Motets, from Psalms 95 and 97. 09:51 The sun came out for the Holy Father who is now driving through Cofton Park on the Popemobile. Papal flags are waving like mad. The Gathering in hymn has just started “Church of God elect and Glorious”. The music is from the late 19th Century. 09:47 Pope approached Cofton Park. He blessed the statue of Cardinal Newman by Tim Tolkien the nephew of JRR Tolkien who wrote the Lord of the Rings. Mr Tolkien, a wood sculptor, made the statue of steel and sprayed it with bronze. 09:44 Mahri Dunlop is at Cofton Park with the Franciscan Sisters of the Renewal. 09:35 During his visit, Pope Benedict has invoked Cardinal John Henry Newman almost daily. The visit takes its motto from Newman. Yesterday evening he held Cardinal Newman up as an example for modern life. 09:31 The German Shepherd has landed in the Midlands. 09:30 On this morning’s Sunday Programme, Eamon Duffy, Cambridge historian, said that Cardinal Newman was the “most luminous Christian intelligence in the last three or four hundred years”. Bishop Kieran Conry said 60,000 people were attending the beatification to see the Pope, and not because of a popular devotion to Newman. He said Newman himself would have thought it a “strange spectacle”. When asked about Cardinal Newman himself saying he was no saint, Bishop Conry suggested that if he had thought he was a saint, that alone would be grounds enough not to canonise him. 09:22 Pope Benedict today will beatify Cardinal John Henry Newman, a 19th Century convert from Anglicanism who is thought to be one of the greatest theologians of his time. Rain has finally stopped. Crowds all so joyful. 09:15 From Andrew M Brown who was watching the Pope depart from Wimbledon. There was a crowd of about six hundred gathered by the gates of Wimbledon Park to see Pope fly off and a very excited atmosphere. They closed the road at the last min then the HUGE convoy rolled past – Pope’s BMW at the front, blue lights flashing in the grill between the headlights, he was travelling at about 8 mph, he turned and luckily was on our side of the car and we could see him smiling contentedly and waving. He radiates peace and serenity. There’s something in his eyes – a sort of twinkle. 09:10 The faithful have been waiting long hours on the field at Cofton Park. One pilgrim phoned in to say that they had left their parish at 1.30 am and arrived at 6am. 09:05 The Holy Father’s helicopter has just left London. The crowd is unbelievable. It’s so exciting and now the helicopter is coming and every one is looking up at the sky. 08:56 As Pope Benedict was making his way from Wimbledon to Cofton Park by helicopter, this morning’s Independent made a bid for tolerance while the Press Associationreported that Prime Minister David Cameron would today praise the Pope for the challenges he has made to the British people during the visit. Meanwhile the Indy’s Joanna Moorhead and the Sunday Telegraph’s Jonathan Wynne-Jones tell the inside story of reporting on Pope Benedict’s visit. Joanna voices her surprise at the Pope’s ability to turn around public opinion while Jonathan gives a blow-by-blow account of the journey.